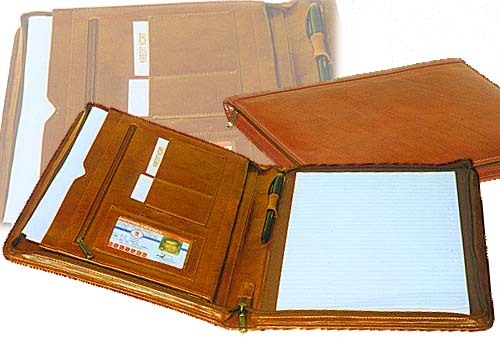 Description : A writing case crafted from the finest Italian Tampono. It is shut by a zip and the closed size is 25cm x 34.5 cm. Once opened, one comes across the place to keep everything for a meeting. The RHS has a slot for an A-4 size pad and a loop for holding a pen. The LHS has a big pocket with an expander and a small plain pocket that can accommodate your catalogue and other important papers. There is a zip pocket and two card pockets. A transparent pocket is provided for your cards.